Chinese New Year is next Monday (it’s the Year of the Dragon) and what better way to celebrate it than share this recipe for Gingery Pork Pot Stickers from Laura B. Russell’s cookbook, The Gluten-Free Asian Kitchen? If the photo above looks familiar to you, it’s because it’s from when I reviewed Laura’s cookbook back in August last year. I’d never made pot stickers from scratch until this recipe. Prior to making them, my only fond memories of pot stickers were eating them after I’d watched Mulan. The most time consuming part is rolling out the dough and shaping the dumplings, but once you’ve got that all out of the way, it’s pretty straightforward. The pot stickers are first fried a little, then – holding lid at the ready, before yourself like a shield – water is added to the hot pan and the lid is quickly clamped on, covering the pot stickers and steaming them. They’re fried a little more after that, then you serve them right away with the dipping sauce or some soy sauce. The best part is that they’re practically indistinguishable from pot stickers made with wheat flour and there is no difference in taste at all. They’re an instant party pleaser! I’ve even had family try them who eat gluten and loved these gluten-free pot stickers. You’ll have people clamouring for more, guaranteed. Even my brother, who claimed that he didn’t like pot stickers, had some and was annoyed when he couldn’t have more, since we were saving the rest (four) for my Dad to try. While I was still making the pot stickers, I had to add the water to the pan to steam them, and told my Mum to put some distance between herself and the stove – she didn’t hear; she was too busy enjoying the stickers! It took a second or third time telling her, until she realized. If you’ve never made pot stickers before, follow the instructions carefully and pay close attention. After you’ve made them at least once, it’ll be a cinch. Dumplings symbolize wealth, as their shape resembles the Chinese tael: a kind of weight measure, although they could also resemble little purses. I was given permission to reprint the recipe from the publisher, Ten Speed Press, as well as use the cookbook’s cover art in my post. You can purchase The Gluten-Free Asian Kitchen on Amazon and wherever books are sold. In a large nonstick frying pan, heat 11/2 tablespoons of the oil over medium-high heat. Add half the dumplings to the pan and cook until browned on the bottom, 2 to 3 minutes. Holding the pan lid in one hand (to control splattering), add 1/3 cup water to the pan and immediately cover it. Lower the heat to low and steam the dumplings until cooked through, 8 to 10 minutes. Remove the lid and raise the heat to medium. Cook until the water evaporates and the bottoms of the dumplings are well browned, about 2 minutes longer. Repeat with the remaining dumplings and oil. Serve hot with the dipping sauce or a bowl of soy sauce GF. Happy New Year – your dumplings look like they came out perfectly. We are having dumplings tonight in celebration of the Year of the Dragon! Thanks, Jeanette, and Happy New Year! These sound great! I’ve only made pot stickers once and I burned them terribly. I think I should try again. Thanks for the recipe! It’s so satisfying to change someone’s mind about a dish. I’m glad your brother liked these! Hey Kaitlin, thanks! 🙂 I’d love to see how yours turn out. Hi Alyssa, I don’t think there is a substitute for sweet rice flour (it’s also known as mochiko flour or glutinous rice flour; it does not contain gluten). You can generally find it in Asian supermarkets or your supermarket’s Asian aisle. Anywhere with a large Asian population should have it. You could also order it online if you can’t find it in your area. I haven’t used sweet sorghum flour, although I don’t know how well it could work since it would be a different structure than sweet rice flour. Using a different rice flour, like white or brown, even if superfine, would not work either as they’re milled from different kinds of rice. Good luck! Thanks Zoe! I think for this time around I’m going to try the recipe as is and then maybe next time I’ll try some substitutions. 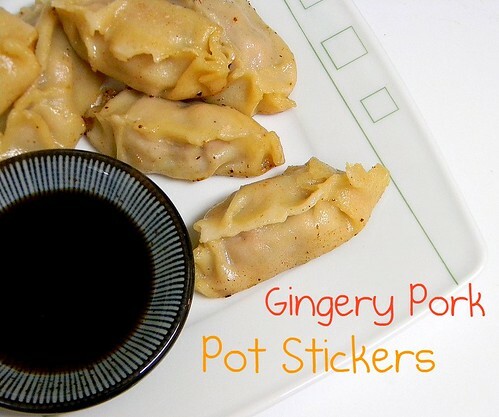 My boyfriend and I are obsessed with Pot Stickers, so I’m super excited to make these for him. Just need to go to the Asian market down the street tomorrow!